Our friends at the NEA posted a great article on their ArtWorks blog about some fun patriotic facts in the arts! Enjoy after the jump! 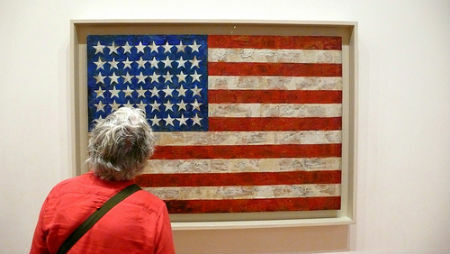 Did you know that the idea to start painting flags apparently came to Jasper Johns in a dream? Did you know that history has a soft spot for jazz hands? When Peter Stone and Sherman Edwards turned the story of our country’s founding into the musical 1776, their work won three Tony Awards, ran for 1,217 performances, and was made into a movie. Did you know that the image we today associate with Uncle Sam (white beard, star-spangled hat, bushy white hair) was introduced by artist and illustrator James Montgomery Flagg—and bears a striking resemblance to its creator? The image first appeared on a cover of Leslie’s Magazine in 1916, and became an icon when it was used on the famous “I Want You for U.S. Army” recruiting posters. Rather than go to the trouble of hiring a model, Flagg based Uncle Sam on his own reflection. Did you know that the melody of “The Star Spangled Banner” was borrowed from a popular British drinking tune, “Anacreontic Song”? On a slightly more inspiring note, the lyrics come from The Defence of Fort McHenry, a poem written by Francis Scott Key after he witnessed the British bombardment of the fort during the War of 1812. Did you know that Norman Rockwell, one of America’s most patriotic painters, was denied entry into the U.S. Navy in 1917 because he was underweight? After some quality gorging, he adequately tipped the scales and was able to enlist. Did you know that it’s possible to pirouette to John Philip Sousa? In 1958, George Balanchine used Sousa’s marches as the score for his ballet, Stars and Stripes, which he choreographed for the New York City Ballet. The 28-minute piece has been performed on a number of important occasions, including the inauguration of Nelson Rockefeller as the governor of New York. Did you know that Bruce Springsteen’s “Born in the USA” was originally recorded as part of a movie soundtrack? Although the final cut of the movie, eventually released as Light of Day, didn’t include the song, “Born in the USA” did just fine on its own. It peaked at number nine on the U.S. Billboard charts in 1984, and is considered by Rolling Stone to be one of the 500 greatest songs of all time.